I will take a break from my side project of a write-up on our favorite (ahem) card broker, Mr. Mint, and put up a card I made last week. This entry is dedicated to Pops aka Willie Stargell. 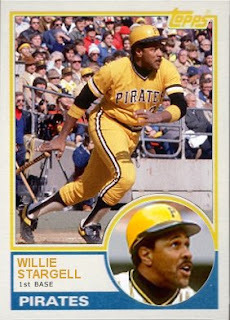 I do not recall much about Mr. Stargell, but I know I did see him come to Jack Murphy back in the early 80s or late 70s. Why do I remember this? The uniforms of course. Along with the Astros and Cardinal road unis, the Pirates uniforms are forever burned in my memory. Imagine, an entire field full of yellow and black (Pirates) and yellow and brown (Padres). Awesomeness to the max! In my mind Willie had an awesome career. Great power and good average numbers. He was the backbone of the Pirates after the loss of Clemente, and I'm glad he won the (co-)MVP at the tail end of his career to go along with a second WS ring. I guess he had the Orioles number, as he's 17 for 54 against them in WS play. Stargell was inducted in the Hall in 1988 and sadly passed away in 2001 from complications of a stroke. He is also part of the all century team. Also, apparently he preferred the name Wilver to Willie, so much so that some of his autographs bear this name, and was called so by Vin Scully. I cherish a 1965 Topps card I have of him that I found blantantly discarded in the dollar bin (I've found so many 60s-70s HOFers in single bins it is unbelievable). "The (umpire) says 'play' ball, not 'work' ball." "Trying to hit Sandy Koufax was like trying to drink coffee with a fork." "Throwing a knuckleball for a strike is like throwing a butterfly with hiccups across the street into your neighbor's mailbox." "They give you a round bat and they throw you a round ball and they tell you to hit it square." (After winning a game in 1979 against the Cincinnati Reds with a pinch RBI single after a disputed check-swing call) "Maybe it was this black bat I used. Or this black shirt or my black arms that made the Reds think they saw something." He should have been the 1971 NL MVP. Great card! I never knew Pops was so quotable, that's awesome!